Finding Pins and Needles: Brrr... ruff! Jack, my wimpy (14ish lb.) Pugalier is already getting cold, in and out of the house. I bought him a sweater (size M) at Walmart yesterday, but it has a pumpkin on it. Although witty... a jack-o-lantern sweater on Jack, it is extremely seasonal. I ventured into my sweatshirts and found a $5 plain sweatshirt of my own (size M probably). I looked at the sweater of Jack's and tried to replicate it. This works for a medium size dog. Not sure if this will work for larger dogs since I use sleeve cuffs for the neck opening. This will definitely work for smaller dogs though. So here is how it went. First I measured the underbelly section and made a template with seam allowances. My next step was to seam rip the cuff of one sleeve (to use later for the neck). Cut the sleeve up the seam and use your template to trace and cut the underbelly piece. 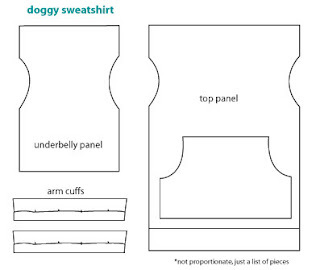 Next take measurements for your top panel and cut your sweatshirt from the front (including the pocket). Remember seam allowances on all sides, including the neck. Next, lay your underbelly piece over your new top panel and trace the arm holes onto the top panel. Then trim the top panel. Next, sew the top panel and underbelly panel together (only one side). You will have two seams, one on either side of the arm holes. You may choose to finish the arm holes with a clean edge, I did not. Next, cut the other sleeve cuff off, with an inch allowance on other side of seam. Sew the 2 cuffs together. This will be the head opening. Next, take your pieced panels and give them a clean seam around the neck hole. When finished, pin and sew your cuffs under the new seamed edge. Next, close up the final side of the panels. When finished, give your top panels extended edges clean edges by flipping over and sewing the rough edge. And vwalla! You have yourself a doggy sweatshirt, for free. This would work great with old sweaters too. Hey! Thanks for this! It's sad that you haven't posted in a while. I begged my husband to buy me a sewing machine for our anniversary, and he did. I found your blog, and BAM! Here I am! Are you still sewing?! I sure hope so. I'm hoping to start my first project really soon. I am still sewing when I have time, I'm preggo with bambino #3 and am busy with 2 little ones already. I've been doing some nursery projects, maybe I'll get a post up soon! Visit Bethany's profile on Pinterest. Take advantage of this special friends-only deal. With my referral, you can save an extra $10/month for 10 months on DIRECTV service on top of the savings you get as a new customer. Get $100 off your new DirectTV hook up via this link! Copyright 2009-2016, Bethany Lois. Simple theme. Powered by Blogger.